When you want an improved garage, you can count on Custom Garage Works! We have been providing a variety of custom garage services such as garage floor coating in Granbury, TX since we originally opened in 2003. After searching high and low in the existing industry, we were surprised to find very few options that were up to a top quality standard, so we got into the industry ourselves, to turn things around. We now offer our clients some of the greatest custom garage solutions around, including high quality cabinets and incredibly durable floor coatings that are superior to epoxy coatings. Our team of experts is dedicated to providing DFW with quality garage solutions and garage floor coating. 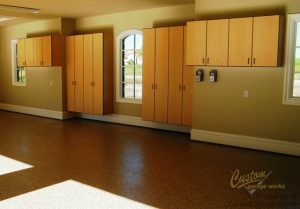 Among our most common services is our polyurea polyaspartic floor coating in Granbury, TX. This coating is so popular because it is both more durable, and cures faster than traditional epoxy. Unlike epoxy that can yellow in the sun, and peel or fall off over time, these coatings are stronger and more durable. In addition to our floor preparation, which includes professional diamond grinding, as opposed to acid etching, you end up with a showroom quality floor that is easy to clean, and practically indestructible. If you’re interested in learning more about our garage floor coating service, please schedule your free estimate when you call 214-494-9068 or 817-308-1305. Thanks to Custom Garage Works’ organization solutions, you won’t ever need to be concerned about running out of space in your garage again. 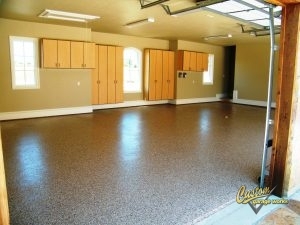 We realize that a brand new garage floor looks best when it isn’t covered by other items in your garage. To address the unique organizational needs of our clients, we offer a selection of different organization products, including overhead storage racks and cabinets. Unlike other business, our storage racks are designed for heavy duty storage, and our garage cabinets are designed specifically for use in garages. If you need a reliable garage floor coating in Granbury, TX, and unmatched organization solutions, you can count on Custom Garage Works. And More! Don’t be concerned by clutter in your garage any longer. We have the organization solutions you requires!